We all know that the beginning of the year is a great time to set a few goals. But by now, you may be feeling the strain of the year’s typical resolutions. Instead of thinking about losing a little weight or tackling those other worthy tasks, take a moment to soak in some of what our great city has to offer. 1. Go ice skating at PPG Place. Downtown Pittsburgh sets the perfect backdrop for family fun! Take in a few sights in the city by donning a pair of ice skates. For a great start to the year, knock this winter activity off your bucket list this month. 2. Shop at the Strip District. You’ve probably heard about the awesome artisan goods and great deals you can find on any weekend at the Strip District. But if you haven’t shopped the various vendors first-hand, make it a point to get there this year. 3. See the city from Mount Washington. There are many places to get a glimpse of the Pittsburgh skyline, but none are quite like what you will see atop Mount Washington. From the city’s three rivers to commercial skyscrapers, you can certainly appreciate a glance at our city from these heights. 4. Visit one of the city parks. Not only does the city of Pittsburgh have an amazing skyline, but it also has ample green space to enjoy. Get out in the city and visit one of the five recreational parks this year. From hiking to biking, there is outdoor fun for everyone. 5. Get a thrill at Kennywood. This is one bucket list item that you can put away until warmer months. 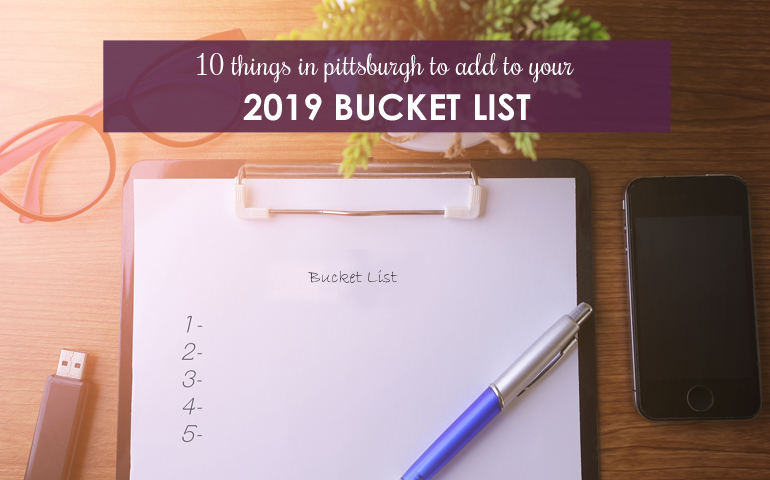 But if you don’t make at least one annual trip to this historic amusement park, you are definitely missing out on some Pittsburgh fun. From Potato Patch fries to thrilling roller coasters, Kennywood is the place to be for summer fun in the city. 6. Attend Pittsburgh sports events. Even if you are somehow not a fan of the Steelers, Penguins or Pirates, you’ve got to see the venues where they compete. Our Pittsburgh sports teams have some of the best facilities in their leagues. So, get the family together and get out to some Pittsburgh sporting events this year. 7. Go wild at the Pittsburgh Zoo and PPG Aquarium. With thousands of animals, children of all ages are sure to find something to love at the zoo. Check out a specific event or simply enjoy one of the many exhibits any day of the week. 8. Explore the Carnegie Science Center. From a walk on the wild side to stepping into science, Pittsburgh really does have it all. The Carnegie Science Center offers four floors of interactive exhibits that are sure to impress any scientist, from young ages to adults. 9. Try local flavors. Yes, Pittsburgh may be famous for pierogies and Primanti Bros. sandwiches. And if you haven’t tried those local favorites yet, you definitely need to do that in 2019. However, the city is also full of other culinary delights. From Butcher and the Rye to Tako and more, you could spend the entire year trying new restaurants in Pittsburgh. 10. See a show. Opera, ballet, Broadway and more. Pittsburgh’s Cultural District is booming with great music, comedy and theater options. Don’t miss out on your opportunity to enjoy the arts in the city this year. There really is something for everyone in Pittsburgh. This year, try something new or take in some of your favorite activities with family and friends. Here’s to spending 2019 exploring our city!